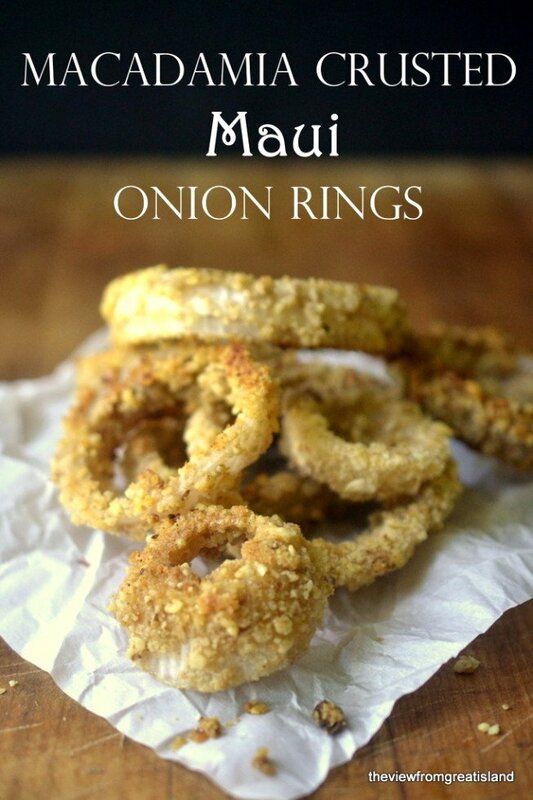 Macadamia Crusted Maui Onion Rings (Baked not Fried) is a healthier and more flavorful version of everybody’s favorite appetizer! 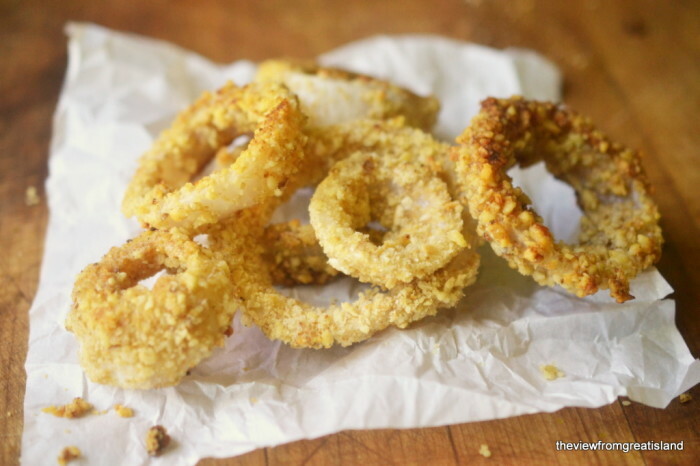 Here’s my thinking on these…if you’re going to forgo the deep frying and opt for a healthier baked version of onion rings, why not go a little wild with the crust? The macadamia nuts toast up in the oven and make these rings extra special. 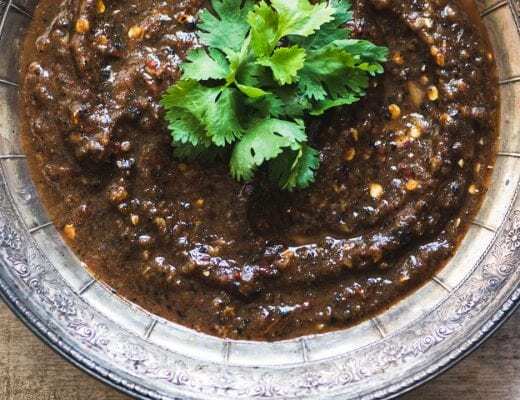 With no messy pot of oil to deal with, you can make these on the spur of the moment. One decent sized onion yields enough rungs for four people to snack on. 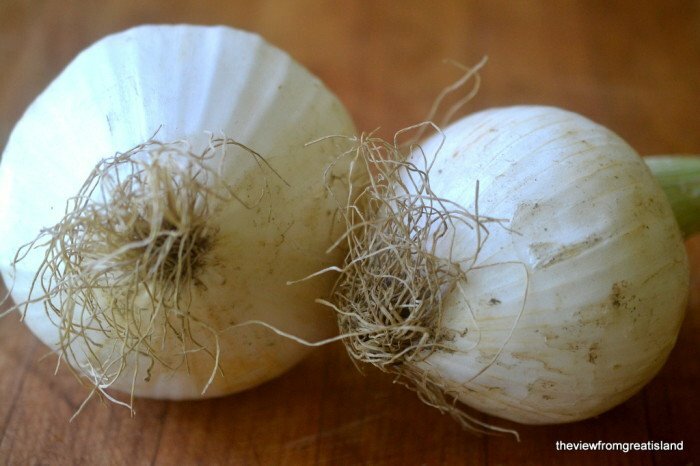 Maui onions, like Vidalias, are naturally sweeter and milder than regular cooking onions. They make a great onion ring. If you can’t find them, use any onion labeled ‘sweet’, they will be right there next to the regular yellow and white onions. 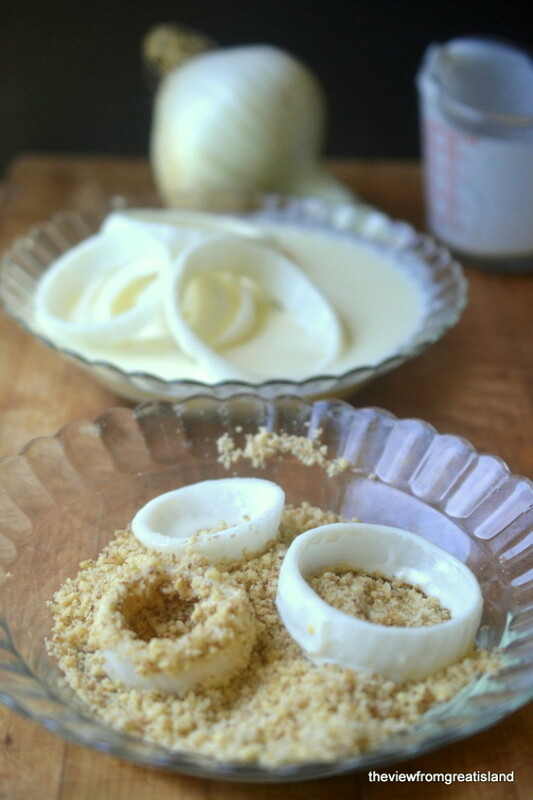 An egg and buttermilk soak before dipping in the macadamia/crumb mixture helps ensure the crust will stick to the rings. These are best eaten straight from the oven, and they really don’t require any sort of dip. But I’m partial to ketchup. Peel and slice the onion into 3/8 inch slices. Carefully separate the rings. Grind the nuts in a small food processor until finely ground, but don't let the machine go so long that it becomes a paste. If you are making your own cracker crumbs, grind a handful of plain crackers, salted is fine, in the same processor. Process until finely ground. You will need 1 cup. Stir the nuts and the crumbs together in a shallow pan. 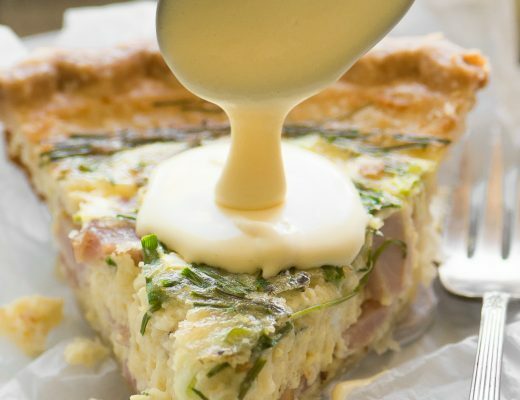 Whisk the egg and buttermilk together in another shallow pan. Put the onion rings right into the buttermilk mixture and let them hang out there. Coat the bottom of a baking sheet with the oil and set it in the oven for 3 minutes. You are going to need 2 trays, or you can work in batches. Take an onion ring from the liquid and let the excess drip off. Dredge it in the crumb mixture. This works best if you keep one hand for the liquid and one hand stays dry for the crumbs. Quickly toss the onion in the crumbs making sure to coat all the surfaces. Set it on the hot pan. When you have filled the pan, bake for about 12 minutes, carefully flipping the rings halfway through the cooking. Drain on paper towels, and serve right away. If the crumb mixture gets wet it will clump and not adhere to the onions. You may want to divide it in half, so that if the first bowl gets too wet, you can start fresh with the other half. What kind of crackers do you recommend? I used a plain water cracker, but if you use an unsalted cracker, you may want to add a bit of salt to the crumbs. I love your tips, like using one hand for dipping and one for dredging – you make this so easy to follow. Toasted macadamia nuts is a very interesting idea! We adore onions, especially sweet. We planted some of those too! I hope my garden grows this year because you’ve given me some great recipes to try. Have a wonderful weekend! Happy, happy Mother’s Day! Like the fact that these are baked Sue! we love onions rings here but hardly ever have them, looks like things will be changing. Thanks! great recipe! Macadamia’s are a favorite and this looks heavenly. I expected to raise my palm and decline on the grounds of cholesterol but you baked them. Now I have to try! I hope you do — I think these are downright healthy when you consider all the health benefits of nuts! Wow, these really look delicious! I love the use of macadamia nuts in the crust. So unique! Thanks for the recipe! My husband is such an onion ring fan but I never make them because of deep frying. 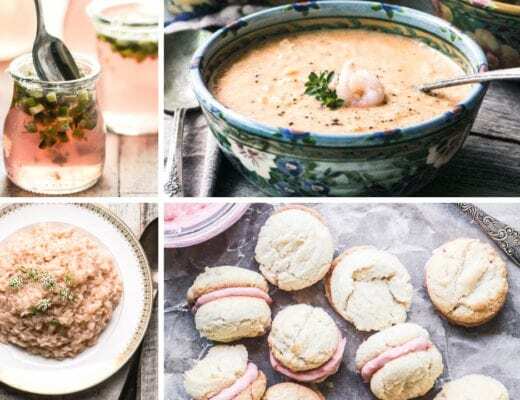 I would love to try your delicious recipe! Onion rings are totally the key to my heart! Using macadamia nuts for an ultra-crunchy coating sounds like the best possible idea. And they’re baked! Hooray! This crust! So incredible, no way I am not making these bad boys soon. I love onion rings and I love nuts. 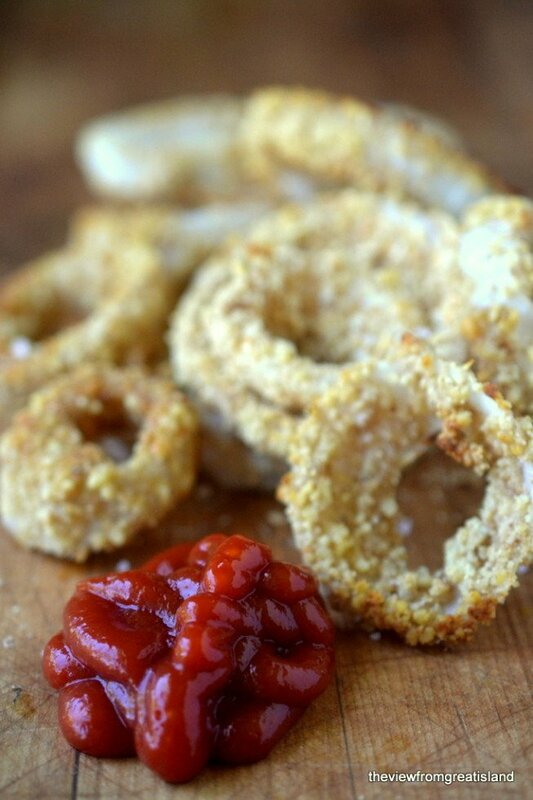 I’m going nuts over these onion rings! Your macadamia crust sounds so good, great idea! Thanks Laura, I think this would be a great crust on Mahi Mahi, too.